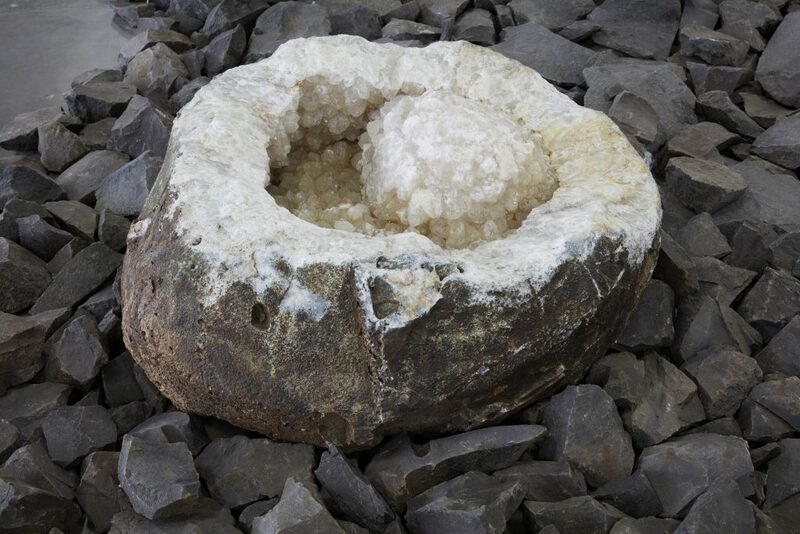 Denise Milan, Brasilis Island, 2018, 33rd São Paulo Biennial, amethyst geodes, quartz, agate geodes, basalt. Photo by Thomas Susemihl. Last week we interviewed art historian and critic Tadeu Chiarelli on the current São Paulo Bienal, this week, our interview subject is São Paulo-born artist Denise Milan, who participates in the grand art event’s thirty-third edition with the solo installation “Ilha Brasilis” (“Brasilis Island”) created with her preferred material for over three decades: the stone. On the third floor of the Bienal Pavillion, “Brasilis Island” ripples like a crystalline creek. This forty-meter-long-by-eighteen-meter-wide area where glittering rocks abound is carpeted by more than two tons of quartz crystals formed two-hundred-million years ago in the depths of Brazil’s tectonic plate. No wonder the stunning sight/site is among the most visited at the Bienal. 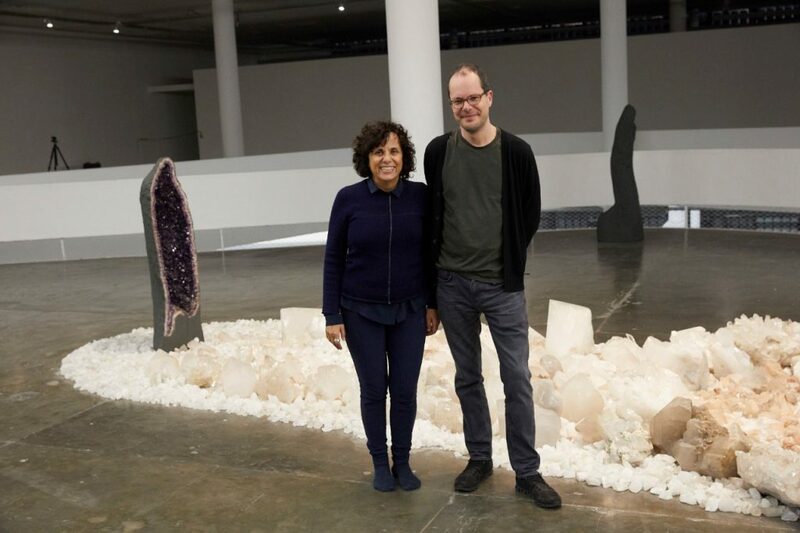 Also in the sparkling installation is a cluster of thirty unopened vertical amethysts, some over two meters in height, the lightest weighing three-hundred kilos, like mysterious figures hovering between past and present in Niemeyer’s fluid 1950s architecture amid São Paulo’s urban fabric. 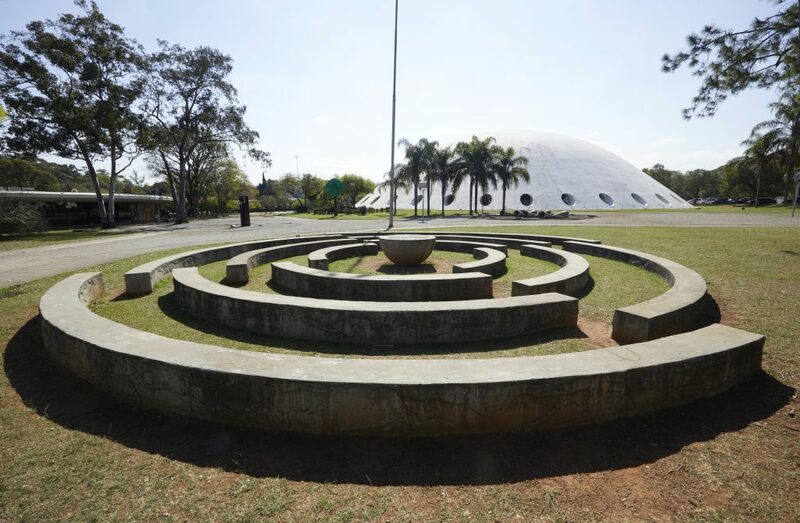 Denise Milan participated in the 20th São Paulo Bienal, in 1988, curated by João Candido Galvão, with Sectiones Mundi, a large sculptural installation in stone that became a permanent feature of the Sculpture Garden of the Modern Art Museum (MAM/SP), in São Paulo’s Ibirapuera Park. 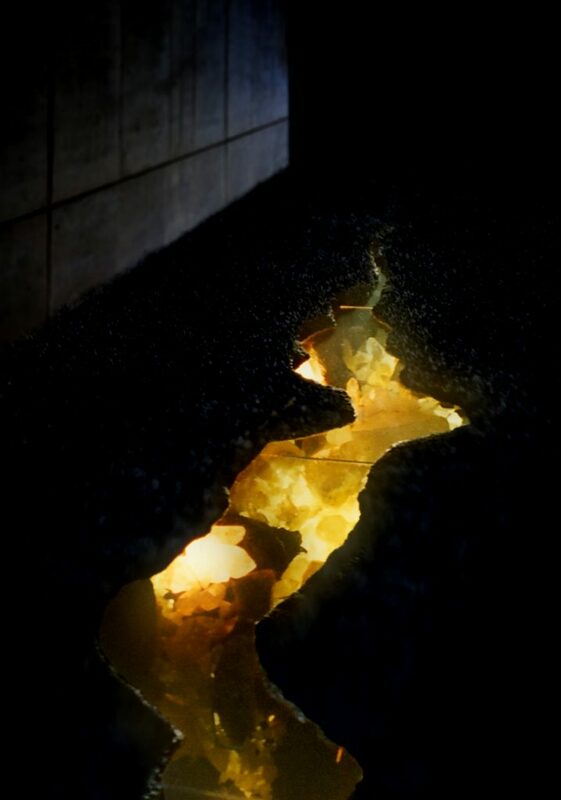 The artist also took part in the 21st São Paulo Bienal, in 1991, also curated by Galvão, with the installation Gruta de Maquiné (Grotto of Maquiné), and in 2008 at the 1st Bienal de Chapingo, Mexico. 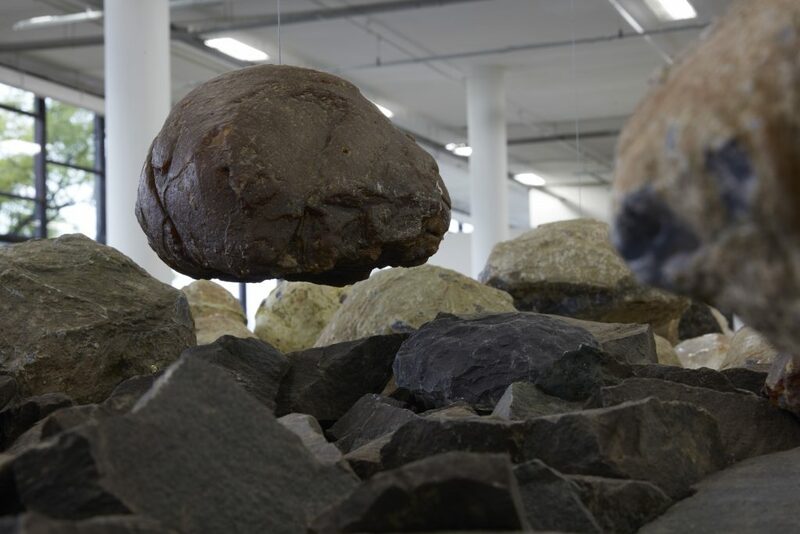 This year, Milan had the solo orDeNAção da Pedra / orDiNAtion of Stone, curated by Marcello Dantas, at Galeria Lume in São Paulo. Denise, explain to us your inspiration for the Bienal installation. I have been looking at stones more and more as human beings because they convey human forms. The more I searched for their narrative, the more they delivered to me their testimonials on the analogy between the human being and the stone, and how, we, humans, are in fact fruit of the Earth’s imagination. We have this big illusion we are separate entities. I believe this is what makes human so sad: we have long forgotten we are part of Earth’s creativity. Tell us some more about this fixation you have with the mineral world. When you sit facing a stone, it will tell you its story. The more you listen—it is extraordinary—a stone tells you about the creation of the Earth and its connection with the universe, since the Earth is part of the universe’s trajectory. When this connection occurs you are no longer isolated because you become part of telluric discourse that combines the solar system, the universe, and larger systems. Not an economic system, a system from another dimension. 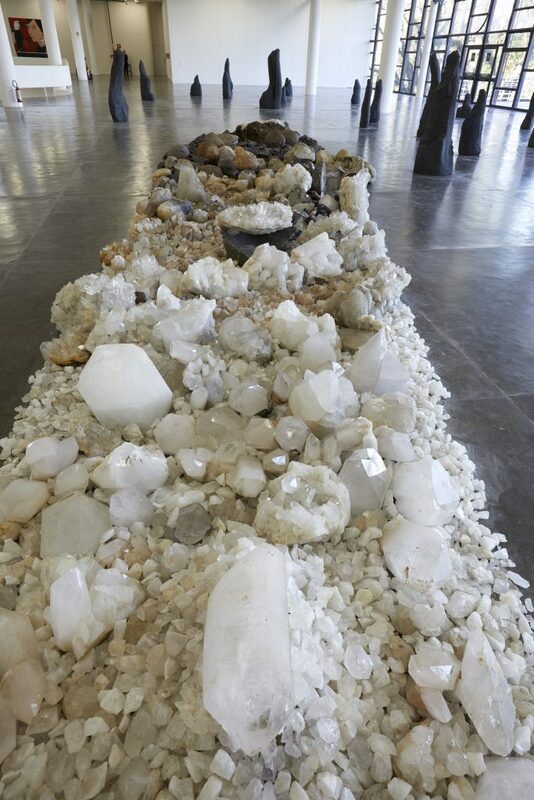 Is there a relationship between your forty-meter-long rock crystal installation at the Bienal and your exhibition at Galeria Lume, this year? Both of them are based upon the same narrative: “Linguagem das Pedras” (“The Language of Stone”), my studies published this year in a book on decoding stones and its creation process. For “Ilha Brasilis” (“Brasilis Island”) at the Bienal, I searched for 200-million-year-old petrous amethyst geode entities from Brazil’s subterranean depth. I created a group where the stones, on the contrary of being luxury objects, are protagonists of their own stories—birth, fights and survival. I named this conflict “Drama of Matter,” an analogy with their individual suffering and the possibility of survival or disappearing in the process of creation. 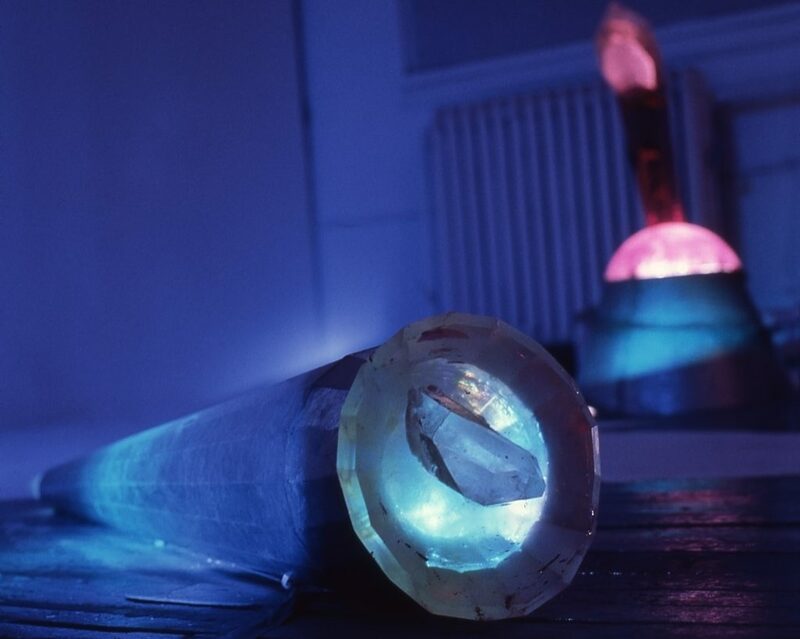 In the installation, the crystals are transformed into art in that they are metaphors that give meaning to humanity. “Brasilis Island” is meant to be an offering to Brazil and to people on Earth so they awaken and reconnect with the laws of nature and guide us to our greater destiny. 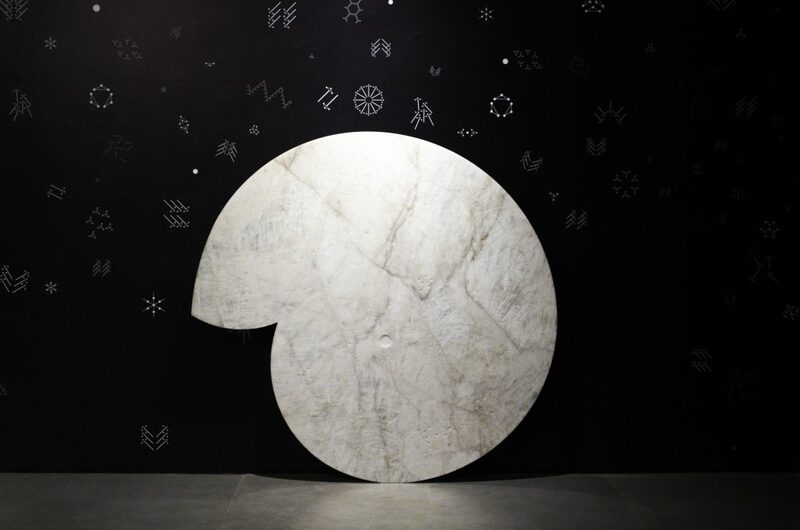 At Galeria Lume, my exhibition “orDeNAção da Pedra / orDiNAtion of Stone” was an invitation for people to get in touch with the stone DNA by creating artistic symbols that connect us to microcosms of the stone which I called Earth Ideograms. 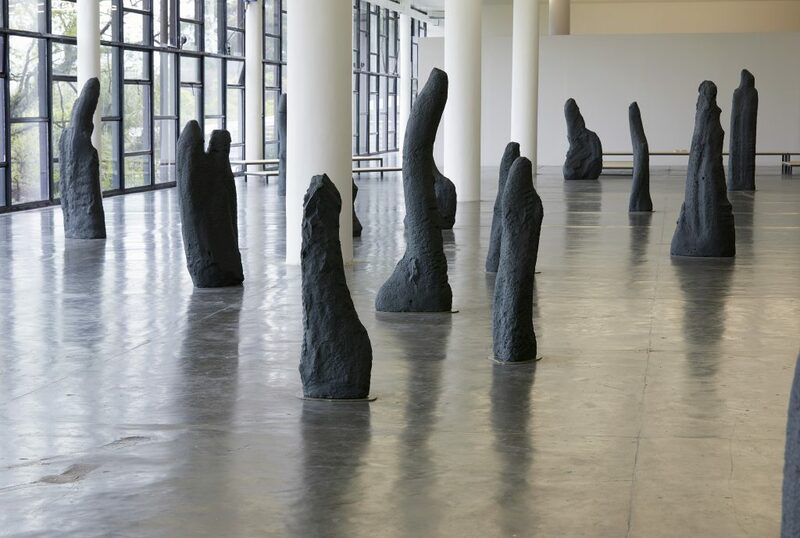 In the show, they form galaxies that have in their center the “Earthly Banquet” with its crystal “appetizers,” memory of time and creation, integrating the sky and the Earth through the metaphysics of the stone. Do you have these stones mined? From what regions do they come from? I never mine. I only work with stones that have already been mined, before they turn into objects and intercede in their destiny offering them back to humanity. They are from the basalt caves of southern Brazil. In the caves, I observe the genesis of the stone and learn from the lessons transmitted by nature. When did you first start working with stones? How have the São Paulo biennials influenced you as an artist? I have been to several editions but the 18th Bienal, in 1985, was an enlightening experience because I first got in touch with John Cage and his performative opera. Another unforgettable moment was the 1991 edition, when head curator João Candido Galvão, with his multidisciplinary approach, brought together the visual and scenic arts. It was my first contact with Bob Wilson’s theater. Denise Milan, Grotto of Maquiné (installation), 1991, 21st São Paulo Biennial, Co-author Ary Perez, mixed media, found objects, incandescent light, galvanized iron. Now give us your impression of the 33rd Bienal. To participate in the vision of Gabriel Pérez-Barreiro in his Affective Affinities biennial led me to reflect on the role of the artist in today’s contemporary art. The way he conducted the artists he selected, both those who curated exhibitions and those, like myself, who created solo installations, was very stimulating and respectful. As the connoisseur of Latin American art he is, he brought a unique view to the event. The works of Feliciano Centurión and Aníbal López stimulate us to think about our relations with life. The intriguing view of curator Mamma Andersson takes us to the mysteriousness of Sweden and surroundings and makes you ponder on the cultural crossroads that fed their colors, traces and madness. The art of Antonio Ballester Moreno reveals an elemental geometry in its direct relation to nature while his interesting curatorship introduced eighteenth-century German pedagogue Friedrich Fröbel whose playful imagination introduced crystals in children’s education. Pérez-Barreiro invited artists with expressions that originate in elementary formations, and concepts that are on the verge to be manifested. There is a strong affinity to the structures of the earth in his curatorship—this is a very contemporary reflection on his part. He dared to open up the blind spots in our perception and placed them under a new light. 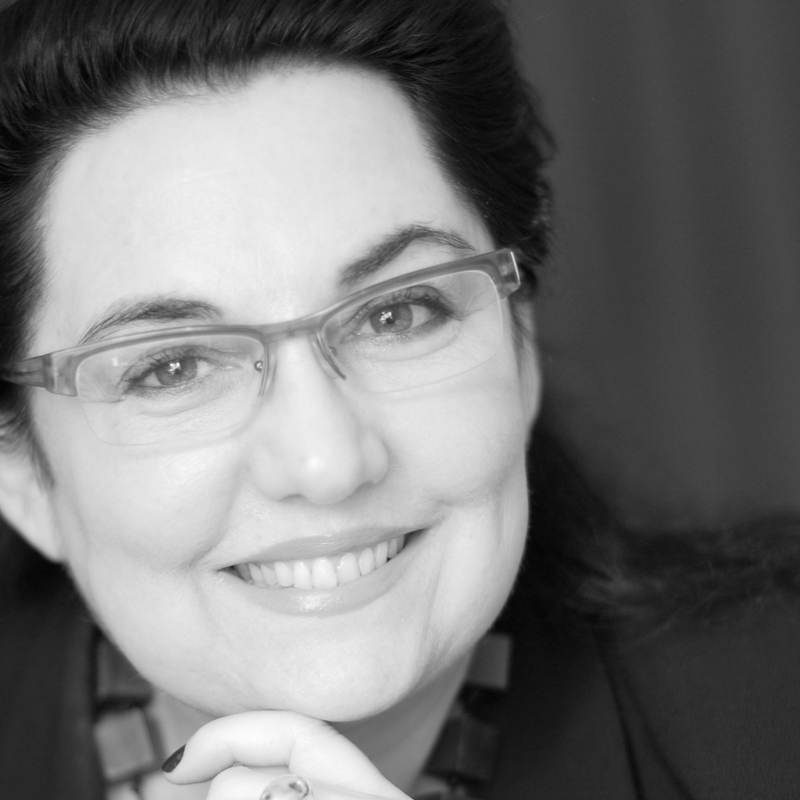 Denise Milan is represented by Galeria Lume.